High Point Country Club High Point Condos: High Point Country Club is one of Naples' best kept golfing communities located one mile from the Gulf beaches and a short drive to downtown Naples. This two bedroom, two bath rarely available end unit has been completely remodeled in 2018. Situated on the golf course, this condo enjoys spectacular unobstructed views of the course and is steps from the clubhouse, fitness center, putting green and pool. The kitchen is complete with custom cabinets, flowing quartz countertops, spacious breakfast bar, Stainless Profile appliances, glass backsplash, Induction stovetop and pantry. The laundry room is designed with a new washer and dryer and functional storage. Frameless glass shower enclosures and white cabinetry enhance the spacious feeling of each bathroom. New impact glass has been installed on all windows allowing natural light to filter in while hurricane shutters line the lanai. Nothing has been overlooked from the lighting, window treatments, solid wood doors, crown molding, storm front door and new AC and water heater. This home is offered turnkey furnished and professionally decorated by Norris Furniture.n The residence includes 2 parking spaces and bundled golf. High Point Country Club High Point Condos: C.15336 Spacious and completely remodeled in 2018, this property lives like new! Nothing is original. Renovations include beautiful new tile flooring, stainless steel appliances, granite counter tops, modern lighting and ceiling fixtures, as well as crown molding throughout. Other great features include a washer and dryer in the unit (which is something not all units at High Point have), and an extended lanai of over 300 sq ft overlooking peaceful landscaped and golf course views. The lanai is truly one of the best at High Point. The master bedroom has a private sliding glass door entrance to the lanai which helps promote a true indoor-outdoor living experience. The condo is light and bright and has one of the largest floor plans at High Point. Where else can you enjoy a completely renovated unit with over 1,100 sq ft of living space, coupled with unlimited bundled golf and a fantastic location close to everything Naples has to offer - all for under $300K? Less than 1.5 miles to the beach, and just a short distance to the shopping and dining of 5th Ave South, Venetian Village, Waterside Shops and Mercato. You truly can have it all! High Point Country Club High Point Condos: Enjoy stunning golf course views from this gorgeous, turnkey furnished 2BR/2BA residence at High Point Country Club. This highly desirable and rarely available third floor end-unit offers an abundance of extra windows that let natural sunlight illuminate this beautiful condo. This unit has been remodeled with high-end finishes throughout including custom cabinetry, granite counters, crown molding, impact windows, plantation shutters, newer HVAC unit (4 years), and so much more. The screened lanai is accessible from both the master bedroom and living room and provides breathtaking views of the golf course. Fantastic location in Naples, only 1 mile to the beach & 2.5 miles to downtown! High Point Country Club offers residents low HOA dues, unlimited golf, 6 pools, clubhouse, restaurant, pro shop, fitness center, tennis, library, friendly neighbors and a active social calendar. This unit has been meticulously maintained and is move-in ready, just bring your toothbrush! This is a 55+ and non-smoking building. High Point Country Club High Point Condos: PERFECT! This condo is COMPLETELY renovated and beautifully furnished and very clean. If you have been waiting for the perfect condo in High Point Country Club to become available, this is it. There is nothing to do, just walk right in with your personal belongings and enjoy the winter in Florida. Enjoy the views of the golf course from your screened lanai with southern exposure. High Point Country Club is located a mile to the beach, 2.5 miles to downtown Naples and surrounded by world class shopping and dining. Enjoy unlimited amenities with your very low quarterly dues: golf, tennis, pickle ball, fitness, 6 pools available daily and included in your dues. The club house has a restaurant, library, meeting rooms for numerous social activities. High Point CC is a active affordable country club located in the best area of Naples. Come and see why people love High Point Country Club. High Point Country Club High Point Condos: Just renovated and beautiful coastal colors throughout with wonderful views of High Point Country Club. New kitchen with granite, new appliances are being installed, new baths, new tile floors. Be the first owner of this remodeled condo in High Point Country Club. Enjoy unlimited daily golf, tennis, 6 pools and fitness. At the clubhouse, enjoy breakfast and lunch during the high season and there are a lot of dinner parties throughout the year. You are given a $200 card per year through your dues to eat at the restaurant. There is a pro shop, library, meeting rooms and on site management. High Point Country Club is located 1.5 miles to the beach and 2.5 miles to downtown Naples, perfect location. High Point Country Club High Point Condos: Prime 5th floor unit in the best building in High Point Country Club. Stunning sunset views. Includes a challenging nine hole executive par 3 golf course ideal for perfecting your short game. Included in your maintenance fee is golf, tennis, swimming pools, raquetball, clubhouse with fitness room, seasonal restaurant, meeting space, pro shop, and library. Unit has new appliances, flooring, and an open kitchen floor plan. Bathrooms are also updated. Building has stamped concrete walkway, and new paint, roof, and elevator controls. Included carport space 57 is conveniently located right in front of the building unit includes separate storage. Truly one of the best located units at High point. Only about 1 mile from the beach and centrally located near the best shopping, dining, recreation Naples has to offer. High Point Country Club High Point Condos: Mr and Mrs Clean live in this top-floor unit with a beautiful golf course/lake view from the glass-enclosed balcony. The balcony sliders have been removed to allow this unit to live like a much larger one. Located conveniently near the elevator. Recently redone/modified kitchen including the removal of the wall between the kitchen and the great room. Upscale appliances. Reference the attached list of the appliances and their features. This kitchen is a cook's delight and offers honed Carrara marble counter-tops. Unit is offered partially furnished; an inventory of conveyed items is attached. Club and golf (nine hole), access is included in the associated fees. No pets and this building recently enacted a no-smoking policy for the entire building. Attractive rental policy of four times a year with a minimum of ninety days each. High Point's location allows owners all the conveniences of living in Park Shore without the high cost of doing so. Put this unit on your list to see before its gone. The on-site restaurant offers breakfast and lunch. High Point Country Club offers an active social calendar of events. This is a 55+ building. High Point Country Club High Point Condos: C.15948 Incredible golf course views are yours in this fully renovated two-bedroom, two-bath condo in High Point Golf and Country Club. A combination of tile and wood flooring make for easy living while granite counters, stainless steel appliances and white Shaker cabinetry update the kitchen. Both bathrooms have been beautifully updated with tasteful design and a modern feel. Closets have been customized and washer-dryer in the unit add convenience not always available is other condos. High Point, a bundled golf community is ideally situated to the beaches, shopping and dining of Naples and surrounding points of interest. High Point Country Club High Point Condos: Unit has been updated with newer windows, ac/hw, window shutters, tile, carpet, solid 6 panel doors etc. Great views of golf course and only one mile to beaches and shopping. Lots of activities here at High Point; Par 3 golf course (unlimited golf included in condo fees), tennis, pickle ball, 6 pools, library in clubhouse, restaurant (serving breakfast and lunch), line dancing, water color painting classes and much more. This is an over 55 building. High Point Country Club High Point Condos: “Wow” will be the first word when you enter this beautifully renovated condo overlooking a pond at High Point Country Club. Attention to detail is evident in every room. The kitchen has white and gray cabinets which complement each other and the backsplash ties both colors together. Direct, indirect and pendant lighting makes this kitchen even more special. The dining and living room offer a contemporary feel with beautiful sliding doors that open to the lanai, a great place to read, relax and dine. The master bedroom has a wall of Ikea closets, plus a walk-in closet. Both bathrooms have been renovated and designed for maximum storage and functionality. The guest room also features an entire wall of Ikea storage, with room for a day bed and an office. Your low monthly dues include unlimited golf, tennis, Pickleball, 6 pools, basic cable, WI-FI and water. The Club House has a dining room, fitness room, pro shop, library, meeting rooms and various social activities. One covered parking space is assigned to the condo. High Point is located a mile from the beach and 2.5 miles from downtown Naples and surrounded by world class shopping and dining. This is a 55+ building. High Point Country Club High Point Condos: It is beautiful! It's the perfect vacation or year around retreat. Third floor unit enjoys the best location in High Point with great views of the golf course and lake. It might be the smooth wood plank flooring that makes this unit feel bigger than the rest. The flooring has a moisture and sound barrier. Maybe it is the open airy feeling from the gorgeous kitchen with the "quiet close" cabinets, new stainless appliances or the quartz counter top or the brick pavered screened balcony. Beautiful master shower! Unit has new electrical panel. There are two suites: the large master suite and the guest suite. High Point is so well maintained. There are low maintenance fees and so many amenities. $1650 quarterly association fee covers the master association and the condo fee. And here is the maintenance and amenities list: Executive golf course, putting green, attended pro shop, heated swimming pools, tennis, fitness center, bocce, clubhouse with restaurant, water and sewer, reserves, fibre optic wifi and so much more. Make an appointment today! Seller expected this unit sold already. High Point Country Club High Point Condos: First floor updated condo, walk right out to the pool from your lanai. Granite counters and stainless steel appliances in the kitchen, renovated master bathroom, updated guest bathroom, laminate floors, laundry room in condo, extra outside storage, one covered parking space plus guest parking. High Point Country Club is a bundled golf community, enjoy unlimited daily golf included in your low quarterly dues. Your quarterly dues also includes, 6 pools, unlimited tennis, pickleball, fitness room, wi-fi/cable and water, you just pay electric. High Point Country Club has an active social clubhouse, a restaurant for breakfast and lunch, fun, themed dinners, a lot of social activities to choose from, or form your own group. High Point Country Club is Naples best kept secret, only a mile to the beach, 2.5 miles to downtown Naples and surrounded world class shopping and dining. This is a 55+ building. High Point Country Club High Point Condos: Possibly the best value in all of High Point. Price reduced to $249,000 and offered turnkey. The moment you walk in this lovely condo you will sense the coastal charm with a warm color palette and a beautiful view of the golf course and distant water feature. Quality furnishings throughout from the flooring to the crown molding, plantation shutters in both bedrooms and window treatment in great room. The solid maple dining table with leaf seats six and has a beautiful matching console. Kitchen has been renovated with tray ceiling. This two bedroom/two bath condo is offered turnkey and will please the most discriminating buyer. Enjoy a round of golf on the executive golf course, a game of tennis, pickle ball, or bocce ball or simply enjoy a swim or lounge at the pool. The restaurant is open for breakfast and lunch November to the end of April. Many social events including music and dancing with Kahlua and Cream, are planned for the residents each month. Very active community. Ideally located in the heart of Naples. This is a 55 and older building for quiet peace of mind. No pets are allowed. Schedule your appointment today. High Point Country Club High Point Condos: AMAZING LOCATION - GOLF INCLUDED CONDO - Beautiful Designer remodeled and turnkey furnished 1st Floor Corner End Unit with Parking just out your front door! Many extras including seamless tile floor throughout, updated bathrooms with glass shower/ tub enclosures, newer Bosch exhaustless washer/dryer located in master suite closet as well as water softeners throughout the condo plus extra storage unit outside of front door. 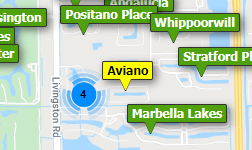 Three miles to Naples 5th Avenue, 2 miles to white beaches, easy walk to dining and shopping. High Point, a very active, meticulously maintained community offers a Clubhouse with Restaurant, Golf Pro shop, UNLIMITED GOLF, 6 swimming pools, Exercise room, Putting Green, Tennis Courts, Library and more! This is NOT a 55+ Building! High Point Country Club High Point Condos: Fantastic sunset views all year long! Two Bedroom Two Bath Condo in the exclusive High Point Country Club. Located in the heart of Naples allows you to enjoy the finest beaches, restaurants and shops in minutes. Owners have updated A/C, Master Bath, Installed Tankless Hot Water Heater, Electric Shutters, Plumbing, Counter tops and more. Furnished and ready for the new owner to call it home. Unique to this home are the two assigned parking spaces, in residence laundry room, expansive lanai and convenience of a short walk to the Club House, Restaurant and Golf Course. High Point Country Club is noted for its social activities and neighborly atmosphere. Truly the Florida Lifestyle you desire at an affordable price and location that can't be beat! High Point Country Club High Point Condos: C.15786 - Premium location with golf course, lake and fountain view make this corner condo exceptional. No driving or elevator needed. The clubhouse, golf course, fitness room, pool, BBQ patio and tennis courts are just steps away. Upgraded and freshly painted, this corner unit features extra windows allowing for a bright and light infused home. The spacious kitchen with 2 windows includes upgraded cabinetry, GE and Jenn-Air appliances, granite counter tops, tumbled stone back splash, laminate flooring and tray ceiling. The updated guest bath features a walk-in shower with designer tile inset. Marble counter-top,and tile flooring. The spacious master bedroom includes a walk in closet,2nd closet and en suite bath. Plantation shutters and crown molding throughout add a casual elegance to this special home. A tiled and glassed-in lanai extends the interior living space bringing the outdoors in - framing the expansive golf course,lake and fountain view.Move in ready - Fresh paint, new carpet and new GE washer and dryer. Amenity rich bundled golf and tennis community close to the beach and the best of Naples. High Point Country Club High Point Condos: Enjoy unlimited golf, tennis, pickle ball, 6 pools and fitness all included in your low quarterly dues. High Point Country Club has a lot of social activities to enjoy in the club house as well as a restaurant and parties. Nice updated condo, impact windows, hurricane sliders. The lanai has been extended to increase the living area. Southern exposure makes this condo very light and bright. One covered parking space plus guest parking. Also included in your low dues are cable, internet, water/sewer public insurance and reserves, you just pay electric. Located 1.5 miles to the beach, 2 miles to downtown Naples, perfect location for your home in paradise. More pictures soon. High Point Country Club High Point Condos: Great opportunity and exceptional value for the area in this well-priced 3rd floor condo with beautiful views of the lake, fountain and golf course. Just one mile east of the Gulf of Mexico beaches, it’s hard to beat this location just off Tamiami Trail convenient to downtown 5th Avenue, Waterside and Mercato. Newer wood floors, new carpet, fresh paint and the bathrooms have been updated. Walk-in laundry with storage. Located conveniently near the building elevator. This is a very active community with golf, swimming and tennis. Clubhouse has breakfast and lunch. High Point Country Club High Point Condos: INVESTORS: RENTALS are allowed up to 6 times a yr for 30 day Minimum. Updated CLEAN CLEAN CLEAN and super cute 1 Bedroom, top floor approx 1.3 miles to the Beach with free golf and 6 pools. Tastefully updated with newer white cabinets and white sink countertop, updated white bathroom with 36" vanity. Living room sliding doors open to a screened lanai with a 2nd set of sliding doors giving a florida room experience. Owners enjoy unlimited golf on the 9 hole, par 3 course, use of 6 pools, clubhouse, fitness, tennis, pickelball, bocce, social calendar, even a library. So affordable, so fun and so close to the Beach. Quarterly condo fee includes wifi and cable too. Need professional assistance selling your property at High Point Naples? Find out how an Area Specialist can help to generate more property exposure in order to get the most money for your investment in the least amount of time.